NORTH CAROLINA – Nearly 1,000 people gathered in the University of North Carolina campus on Wednesday night in mourning for three young Muslims students shot dead on Tuesday. 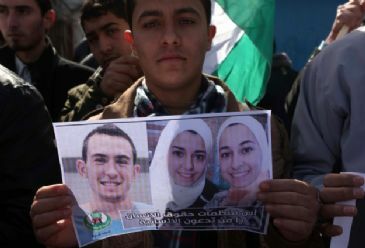 The crowd, including the parents of the young students, displayed wedding pictures of newlyweds Deah Barakat, 23, his wife Yusor Mohammad, 21, along with her sister Razan Mohammad Abu-Salha, 19. The trio was shot dead at a residential complex in Chapel Hill on Tuesday evening local time. Forty-six-year-old Craig Stephen Hicks reportedly surrendered to police after the attack. Initial media reports said the deaths were linked to a dispute over parking but others have suggested a hate-crime motive lay behind the triple homicide. "We still cannot believe; we are in shock," said Deah Barakat's schoolmate Fatia Zohra Hedadja. Speaking to The Anadolu Agency, Hedadja – who had attended Barakats’ wedding – said: "We watch crime news every day on television but who would have thought we would have witnessed a similar story happening to someone to close to us?" "Far from evilness and pure," Hedadja said of Deah Barakat. Barakat was a Syrian-American dental student running a campaign to raise money for Syrian refugees in Turkey. Barakat was also planning to visit Turkey to help Syrians with their dental problems. The funerals for the three victims will be held on Thursday in Raleigh mosque, near the victims’ house. The Council on American-Islamic Relations has called for an investigation into the motive behind the shooting, as many on social media raised the issue of safety of Muslims in the country. Chapel Hill Police Chief Chris Blue said: "Investigators are exploring what could have motivated Mr. Hicks to commit such a senseless and tragic act," and added that "We understand the concerns about the possibility that this was hate-motivated, and we will exhaust every lead to determine if that is the case."